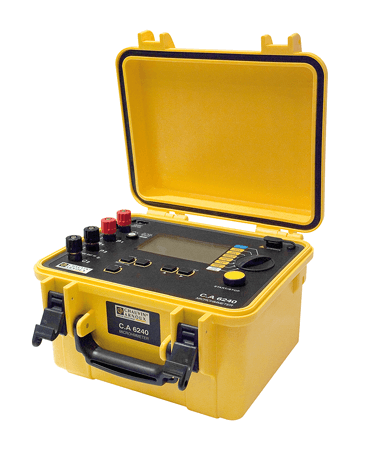 Rugged and leakproof, the C.A 6240 is a top-of-the-range product designed for on-site, workshop or laboratory use. It is ergonomic, lightweight and compact.Its wide LCD screen comprising 2 digital displays is particularly easy to read. 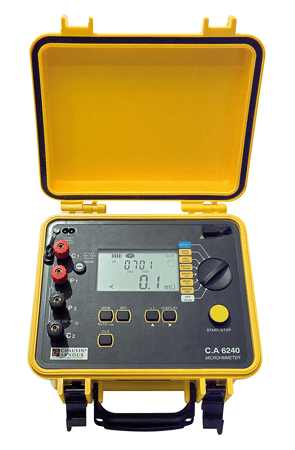 The automatic measurement mode allows measurement to be triggered without pressing a button. An automatic recording mode is also available. To make them easier to use and to permit new applications, new retractable 10 A KELVIN test probes are now available as accessories. Resistance 2 x 50 mΩ max.